Which person or persons, in the questions below, struggled with performance anxiety as an adult? Mr. Z., 29 years old, froze up on stage when he played his cello because his parents got divorced when he was 2 years old. Ms. A developed tendonitis in her arm because she was angry with her father. John’s father was a successful business executive who traveled often. Abby had a sister who was 2 years younger than she was. Mr. C’s mother had post-partum depression. Anne was a straight A student and graduated as valedictorian in high school. If you answered True to all of the questions, you could be correct. If you answered False to all of the questions you could be correct. If you had mixed answers, you also could be correct. But you also could be wrong. There are many psychological routes to developing performance anxiety. But a common denominator is early childhood. By the time an adult experiences the familiar symptoms of anxiety in performance – any kind of performance – the seeds have been sewn years before they appeared. Yet it is no guarantee that early experiences and relationships with others will ripen into performance anxiety. There are many influences and relationships we all have in life that can help lessen or avert the stressors involved for some people when performing. No two people are alike. The reasons for performance anxiety are multiple and unique to each individual. Wouldn’t it be nice if we could find simple answers? But the questions are complex. What is important to realize is that if you struggle with performance anxiety, your struggles begin long before you walk on stage, before a podium, or a class, or sit down to write a paper, or otherwise assert yourself in a situation before an audience. In fact, performance anxiety often begins before you learn to walk. Childhood is the time where both our bodies and our minds are developing rapidly and unable to cope with the many stimuli and events that surround us. A child does not understand why the sun rises in the morning, but a 3 year old once told me that the sun “came up so I can see my clothes to get dressed”. This is charming. It is also magic thinking. It is not scientifically based, except in the child’s mind. It is a delightful way of explaining what the child observed but did not and could not understand. So the child made the sun work for him – the solar system made it easy for him to see his clothes to get dressed. Children normally think in terms of “I’ and “me”. The world revolves around “me”. This is normal thinking for young children. Whenever we experience a void in our knowledge – whether as children or as adults – we fill it in. But we may fill in with misinformation which will become a part of how we think later in life to explain mysteries to ourselves. It is the way the mind works psychologically. So, when Mr. Z’s parents divorced when he was 2 years old, it would be normal for him to think he had caused this loss and blame himself. He would also likely suffer from the separation and big readjustments in his family. Ms. A’s tendonitis and physical pain could have been related to her own anger at her father for his temper toward her and her mother – and feeling guilty, she worked so hard that she developed physical symptoms. John may have thought that his father’s business trips were abandonments and that he would never come home. He would feel devastated and left alone. As an adult, he also could have had competitive strivings of his own, but could not let himself exceed his father’s professional success. Abby woke up one day and her mother was not at home. There was a baby sitter waiting to say good morning. Next thing she knew, her mother brought home a tiny infant– a rival!!! Abby had to share her time and attention. Plus she didn’t understand why Mommy disappeared in the first place. Mr. C’s mother experienced post partum depression. Although he was an infant and had no way of “knowing” what was going on, he did experience a lack of bonding with her in his earliest days because she had been emotionally unavailable. He felt confused and unable to rely on others afterwards. Anne was a brilliant student – an overachiever – she was praised lavishly by all who knew her. What no one really knew about was her underlying depression and anxiety that kept her glued to her studies all the time to avoid these painful feelings. While her grades were exemplary, her deeper feelings were empty and sad. By now, I think you are getting my gist. Performance anxiety casts a broad net – typically in areas that might not be obvious. But the roots of performance anxiety are buried deep in feelings about loss, abandonment, separation, guilt, and competition – all projected onto the audience who can love, leave, and feel judgmental. In fact, the roots of performance anxiety hide in the recesses of the mind because issues around early loss, separation, guilt, and competition and are too painful to remember on a daily basis – if at all. The unconscious is a reservoir for such painful emotions. Be we do “remember” early traumas – by symptoms of anxiety that are painful and disguise earliest precedents. These symptoms come alive when we go before an audience who can love us or leave us; criticize or praise. The ghosts in the nursery come alive as anxiety symptoms or old childhood feelings that get stirred up. Some people are fortunate to have parents who are tuned into childhood needs. There are also grandparents, aunts, uncles, teachers, and friends who can help modify some of the psychological difficulties of growing up. But often well-meaning people who are emotionally available are not trained to recognize the subtleties that lie beneath the surface. And no one has a perfect childhood. This is why so often that being smart, talented, and industrious do not solve the complexities of performance anxiety. The roots are often deep and the “try harder” strategies or “don’t think about it” advice don’t work – at least not for the long haul. We all take our life history on stage with us – for better or for worse. 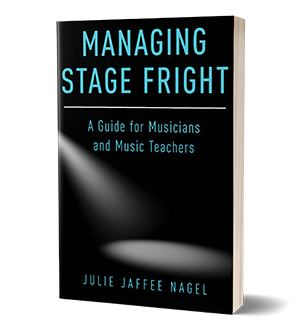 If performance anxiety inhibits your enjoyment or even prevents you from doing what you want to do, professional help can help you restore or establish pleasure in performing. It is my pleasure and to help people who struggle with performance anxiety to work toward removing the childhood ghosts that hover around their performances. Closing question to foster commenting. It always sounds fresh and compelling no matter how often I have listened to your discussions and talks on this subject.